Everyone approaches wellness differently. Maybe for you it's having a cup of freshly pressed juice in the morning. Maybe you're building up to run a marathon soon, so you frequently jog. Maybe you've started meditating and now you can't stop talking to your friends about its benefits. Maybe you tried yoga once, figured out it's definitely not for you, but still practice deep breathing techniques. Mindbodygreen understands that. Over 5,000 people contribute articles to mbg from across the world, from everyday health and wellness enthusiasts, to celebrities, to authors or doctors who are academic experts on those topics. "We wanted to give people the tools to make changes in their lives," said Jason Wachob, the CEO and founder of mbg. "It's a unique way of seeing wellness, from the ground up and from the top down." "You should be able to read about meditation and be able to learn it, even if you live in Tulsa," said Wachob. Mbg breaks down many topics, from recipes to techniques and trends, across articles and video classes, as well as big in-person experiences like meet-ups for its users. Brands have started to pay attention to mbg, thanks to its interesting position in the market. Its core demographic is women in their early 30s, typically on the higher end of the income scale, who live in metropolitan areas. But it doesn't stop there, as everyone has a different way of defining what health and wellness means to them. "We think this lifestyle speak to all shapes and sizes," said Wachob. "With mindbodygreen, we're here whenever you need it. Some publishers are targeted toward very specific niche audiences." According to Wachob, people in their 20s are thinking about exercise and their bodies; in their 30s, it's all about meditation and taking care of their minds; in your 40s, it becomes about worrying about the environment; and in your 50s, your focus turns back to your body. "Our brand is a lifestyle, since we can age with you," he said. "No matter what, we want you to be able to go to our homepage and find something for you." Mbg has also become a guru, of sorts, for brands who want to get into the health and wellness space. By acting as a consultant, mbg has worked with brands to show them what their wellness content strategy could be, as well as partnering with them for specific content pieces. By partnering with websites who focus on health and wellness content, brands can join consumers on their journey. Whether its reducing the amount of sugar in their diets or helping to understand how food allergies function, brand partners can be there as people learn from mbg's experts. Brands can also, as Wachob pointed out, produce more actionable content that also focuses on being relatable. Because anyone can post content that appears to be green-centric, mbg must establish its credibility. To address that, mbg works with professionals and experts to develop trust with its readers. Another option is to tap into the power of social and digital influencers, but you have to do it seamlessly. Wachob advised brands like Kit and Ace to use mbg's network of influencers and experts who can show off the technical apparel and how it fits into their lives easily. green juice, smiles, and exploring with @shelbysphoto shooting for @kitandace. 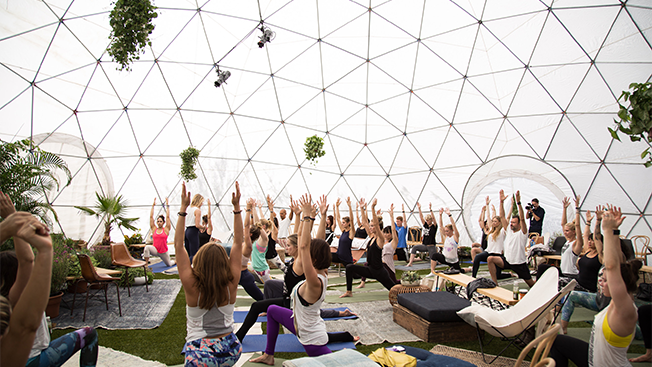 Immersive events are also great opportunities to get in touch with the health and wellness community. Mostly, as Wachob said, it's a way for brands to "position themselves as an advocate for consumers." Brands like EVEN Hotels have worked with mbg in what they call a "360" partnership. EVEN Hotels want people to stay well and healthy even while they're traveling. They, too, understand that wellness is an individual experience and built their brand around four key areas: nutrition, fitness, productivity and rest/rejuvenation. "The breadth of what mindbodygreen covers was important to us as a partner," said Jason Moskal, the vp of lifestyle brands with EVEN Hotels. "We wanted to immerse consumers in the wellness-minded experience." Mbg and EVEN Hotels partnered to create events within the local community around the launch of the new hotel space, which included a livestreamed panel of nominees from mbg's Wellness Warriors to Watch. The watchlist was also sponsored by EVEN Hotels, hence the 360 aspect to this partnership. "By partnering with thought leaders around tentpole opportunities for our brand, we were able to add credibility as we launched and started to grow," said Moskal. "There are different ways to partner with people in order to amplify the message around wellness." "America is just getting sicker," said Wachob. "There are numerous things all at once, not just millennials who are worried about the environment now, that are affecting us. We all just want to feel good within our own bodies."